Mix flour and salt in a bowl. Cut in butter or shortening with a pastry cutter or with your fingers until the pieces are the size of small peas. Sprinkle in water and toss with a fork until the pastry sticks together and you can form it into a ball. You can dust a work surface with flour and roll out the dough with a rolling pin, but the easiest thing to do with gluten-free flour is to press the dough into the pie tin. Prick the bottom and sides of the crust with a fork and bake for 8-10 minutes. The crust will look golden brown. Decrease oven temperature to 400°F. Stir together sugar and tapioca OR corn starch in a saucepan. Stir in water. Cook on medium heat, stirring occasionally and watching for it to begin thickening. Once it starts to thicken, it will do so very quickly. Stir constantly at this stage and let it boil for a minute. Stir about half of the thickened mixture into the bowl of egg yolks. Mix this back into mixture in the saucepan. Boil and stir for another minute. Remove saucepan from heat and stir in lemon juice and peel. Beat egg whites and cream of tarter until they are foamy. Continue to beat while adding sugar one tablespoon at a time. Beat until meringue is stiff and glossy. Beat in vanilla. Use rubber spatula to spread meringue over the hot filling. 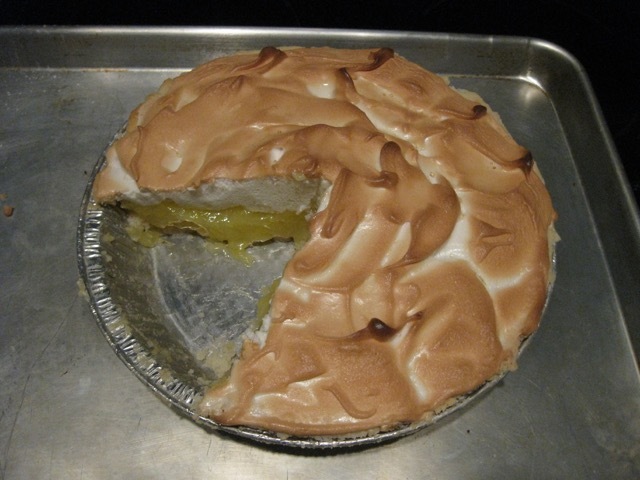 Make sure to seal the meringue to the edge of the crust so it doesn’t shrink while baking. Bake for 10 minutes. The meringue will be light brown. Cool away from drafts for 2 hours. Store pie in refrigerator until you serve it.